We have moved our blog entries to https://medium.com/journalismthatmatters. 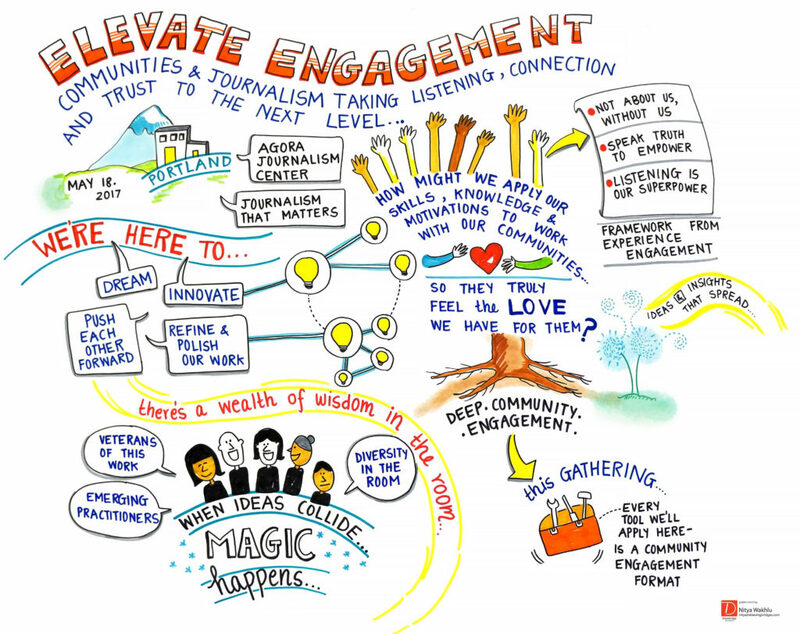 How do we know engaging community matters? Journalism That Matters just released a report on what we’ve learned. A summary is here. A dynamic group of 130 journalists, researchers, engagement practitioners, and community leaders gathered in May 2017 at the Agora Journalism Center for the Elevate Engagement workshop. Over a four-day journey, participants explored a common goal — envisioning how engaged journalism can help communities thrive. More specifically, how could we take listening, connection, and trust to the next level? Elevating Engagement – May 2017 from SOJC Agora Journalism Center on Vimeo. For more about the conference, visit the Elevate Engagement site. ATHENS, Ohio (Sept. 25, 2017)—Journalism That Matters (JTM) has received a $150,000 grant to work with residents in regions of Southeast Ohio that lack access to daily, local news and information to design systems for inclusive conversations and community-based decision-making. Led by Dr. Michelle Ferrier, an associate professor in the E.W. Scripps School of Journalism at Ohio University, the Media Seeds project will help local stakeholders leverage existing community assets and create new, inclusive communication tools. The Media Seeds: Southeast Ohio Project is funded by the Jefferson Center as part of Your Voice Ohio, a nonpartisan effort to produce more relevant, powerful journalism based on the needs and ambitions of Ohioans and Ohio communities. Your Voice Ohio is supported with grants from the Democracy Fund and the John S. and James L. Knight Foundation. In addition to working with residents in “media deserts,” JTM will collaborate with Your Voice Ohio to support deep engagement between Ohioans and local news. The media collaboration includes more than two dozen news partners throughout Ohio. Ferrier, the project director, is the former president of JTM and the principal investigator for the Media Deserts Project, a research project that has been mapping media access at the local level in the United States at www.mediadeserts.com. As part of the project’s growing statewide data, Ferrier mapped opioid deaths to the media desert maps of Ohio. The Media Seeds Project will look at geographies hard hit by the opioid epidemic and media deserts. Ferrier is also the chief instigator of the Create or Die gatherings, an innovation collaboration workshop developed with Journalism That Matters. JTM has hosted Create or Die events in Greensboro, North Carolina and in Detroit. Ferrier has been an advocate for media entrepreneurship and innovation at the local level. “I am committed to working with my neighbors and Ohioans across Southeast Ohio to connect, to imagine a new narrative for Appalachia and to seed communication experiments that serve our communities to thrive,” said Ferrier. Journalism That Matters is a nonprofit organization that has been bringing together diverse community stakeholders to re-imagine the local news and information ecosystem and the role of journalism in a democracy. For more than 15 years, JTM has supported journalists, technologists, librarians, city planners, investors, media managers and others to shape new storytelling roles and story creating practices that support communities to thrive. Following two breakthrough journalism and community engagement gatherings in Portland in 2017 and 2015, Journalism that Matters (JTM) released a framework for how journalism and other forms of civic communications interact to support thriving communities. The framework outlines new skills and knowledge to enhance a journalist’s effectiveness in community engagement as well as highlighting ways in which journalists can bring added value to communities as conveners of conversations. Ferrier and JTM will be employing these practices in the SE Ohio work. Dr. Laura Black, associate professor in the Ohio University School of Communication Studies, will also be a partner on this project. “JTM has been at the forefront of imagining new roles, new practices and new ways of fostering engagement. We will be employing those principles as part of our work. and re-imagining what it means to have a civic communications ecosystem that is inclusive,” said Ferrier. Regional residents interested in the project can get more information at http://mediaseeds.wikispaces.com/ and see upcoming programs and regional events. For more information, contact Dr. Michelle Ferrier, ferrierm@ohio.edu or 740-593-0899. Journalism That Matters, a Seattle-based nonprofit, has been hosting breakthrough conversations with community and national stakeholders on the emerging news and information ecology. For more information on JTM, visit www.journalismthatmatters.org. Jefferson Center is a nonprofit organization that partners with citizens, communities, and institutions to design and implement informed, innovative, and democratic solutions to today’s toughest challenges. For more information on our programs and mission, visit jefferson-center.org. On May 18-21, 2017, a diverse group of 130 journalists, researchers, engagement practitioners, and community leaders gathered at the Agora Journalism Center for Elevate Engagement. Over a four-day journey, participants explored how engaged journalism can help communities thrive. More specifically, how could we take listening, connection, and trust to the next level? On the final day, participants identified themes that could support an emerging engaged journalism community of practice to thrive. The result is a proposed foundation for such a community in the form of an Elevate Engagement Manifesto.